Classical music made quite an appearance at the explosive Winter Olympics opening ceremony, with music by Russian masters Tchaikovsky, Borodin, Stravinsky and Khachaturian as well as performances from Anna Netrebko and Valery Gergiev. Take a look at the stunning pictures. And we're off! 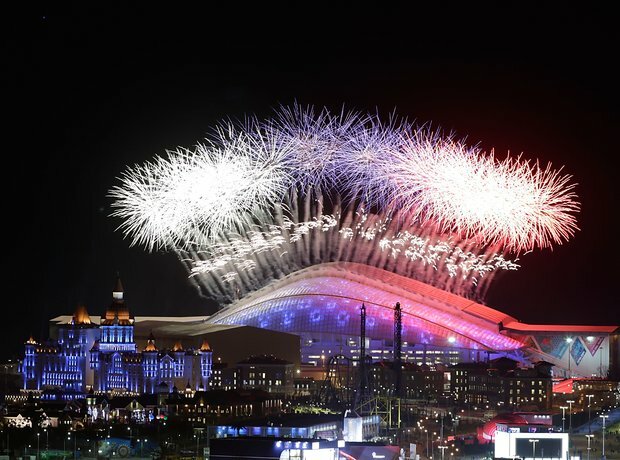 Incredible fireworks and a light show at Sochi's £31billion Opening Ceremony - the most expensive opening display in the history of the Olympics. A young girl named Lubov (translated as Love) flies through the air at the Sochi 2014 Opening Ceremony over a dream world of Russian landscapes. The Russian flag lights up the stadium as the flags of all nations competing in the games shine brightly overhead. It's Team GB! Proudly waving their Union Flags, the athletes arrive in the Fisht Olympic Stadium. A warm welcome for all our athletes as they join the parade ahead of two weeks of competition. The Fisht Olympic Stadium lights up in the night sky after sunset; the ceremony started at 20:14 local time. Clever, eh? Inspired by St Basil's Cathedral, Russia brings a splash of colour to the stadium with this incredible indoor architecture. It's not just the architecture: this ceremony was soundtracked by some of Russia's most famous composers including Tchaikovsky (who made a few appearances! ), Borodin, and Stravinsky. Taking a look at the bigger picture: every country's team walks over the white road in the middle of the stadium while a detailed animation of each country shines below. St Basil's Cathedral and an incredible chorus of dancers ensure the Russian games gets off to a suitably patriotic start. A sunset, clouds, and a winter wonderland below as Lubov flies overhead, soundtracked by music from Borodin's opera, Prince Igor. Snowy scenes from the Sochi opening ceremony, summing up Russia's history in the space of two hours through music and dance. Don't think Russia got the memo about how many Olympic rings there were meant to be... four out of five snowflakes expanded to become the interlocking Olympic symbol, but there was a slight technical hitch prompting the hashtag #Sochifail to trend on Twitter! Despite a minor hiccup, it's hard to ignore the beauty and detail in the lavish ceremony - all the clouds and islands are suspended from the roof. Incredible scenes from dancers including performers from the Bolshoi ballet at the Sochi games, showing the best of Russia's talent. A chorus of singers joins hands in a symbol of togetherness. Danila Korsuntsev and Svetlana Zakharova perform an entrancing display on stage. It's the swinging sixties in Russia's vibrant whistle-stop history lesson. Cue dodgy dancing and bright colours. Soprano Anna Netrebko fills the stadium with her operatic voice singing the Olympic Hymn. The Olympic flag flies next to the Russian flag as Anna Netrebko blasts out the Olympic Hymn. The Olympic torch completes its journey and is set to light the Olympic flame. It's shaped like a Firebird, a Russian mythical creature from fairy tales - and the subject of Stravinsky's ballet. After two hours of history, music and dance, the Opening Ceremony comes to a close with a spectacular fireworks display - soundtracked by Stravinsky, of course! Fireworks light up the sky in Sochi as Russia celebrates the start of its Winter Olympics. A successful show from Russia, with no expenses spared on the pyros. Colourful and vibrant, Stravinsky's music plays out as the fireworks symbolise the end of the Opening Ceremony, and the start of the games.